FantasyDraft is one of the newest entrants into the Daily fantasy sports circuit, which kicked off their foray into the market with a beta product, and then recently launched their full site in December of 2014. Much like other contenders in the market, Fantasy Draft too offers gaming in all major sports like NBA, NHL, NFL, MLB but also Golf. They have several free contests and the paid ones have been known to start off as low as a dollar per entry, which is pretty impressive. But what most DFS enthusiasts are asking is, ‘why should I make the switch,’ and more importantly, ‘what’s in it for me?’ The more renowned contenders in the DFS circuit obviously offer a much larger user base. This massive user base allows these established sites to have bigger contests with much larger payouts. These payouts in turn, attract more users, therefore resulting in a cyclic effect? So can newer sites like FantasyDraft break the cycle? Well, two important things that FantasyDraft has going for it, is its strong referral program and professional athlete partnerships. Apart from that, does it have what it takes to sling itself to the top rankings? The gauntlet has definitely been laid down by the big guns in the DFS circuit, but will FantasyDraft be able to pick it up? Let’s find out. In our FantasyDraft review, we will try to cover pretty much everything you need to know about this dark horse, its contests, payouts, website interface, promos, what you’ll love and what you’ll hate, and of course, whether you will keep coming back for more. FantasyDraft is a relatively new offering to the world of DFS, offering daily and weekly real money fantasy sports contests, allowing players to compete for cash prizes in all of the major sports – MLB or fantasy baseball, NHL, NFL, CBB, CFB, PGA and NBA. Their responsive website can be access from pretty much any device a user may be accessing them from, be it an iPad, iPhone, Android device, PC, tablet, or a Smartphone. The cool thing about FantasyDraft is that they are self-labeled ‘rookie sensations’, as they have mentioned on their site. According to the makers of FantasyDraft, there are 3 reasons to jump on their bandwagon – you get to play where the pros play, they have a larger payout, which translates to a higher chance of winning cash, and finally, FantasyDraft is the only multi-tiered pay-for-play referral program in fantasy sports today. The FantasyDraft games include a salary cap contest for all major sports including MLB, NFL, NBA, PGA, NHL, CFB, and CBB and they have a variety of contests to keep players hooked. FantasyDraft has only been around for a few months and so far this rookie sensation hasn’t offered any promo codes just as yet to its user base. The first few months of its arrival onto the scene saw its beta site being offered to players, after which it launched its full site as of December of 2014. Players will have to wait a little while longer before they can get their hands on a FantasyDraft promo code. But up until then, there are the professional athlete partnerships and impressive referral program to revel in. FantasyDraft may be a rookie, but it’s definitely a sensation. Don’t be put off by their limited user base. After all, they have only been on the scene for a few months. Their large payouts, wide variety of contests, user-friendly site navigation, and simple line up construction are just some reasons to consider joining them. Here are a couple of reasons FantasyDraft stands out in our minds. One big thing that FantasyDraft has going for it is the fact that it has teamed up with prime athletes, which is quite a unique offering, unlike anything the world of fantasy sports has seen thus far. Sometimes, in fantasy sports people tend to forget that the game is played by real people playing sports. These players tend to assume the role of a share or stock or a share. But on FantasyDraft, these players transform into our very competitors. Players like Drew Brees, formers outstanding coaches such as Jimmy Johnson, TY Hilton, Boomer Esiason, and Jordy Nelson have actually partnered with FantasyDraft and play. The unique concept that one can actually play against the people that you choose is not only exciting but undoubtedly cool and is definitely something that you can brag about at the water cooler at work or on your Twitter or Facebook account which we know you are well prepared to do. No one really wants to know how your fantasy football game with your roommate went, well, perhaps your buddies. But if you beat someone like Drew Brees by using Drew Brees, that’s a whole different story worth listening to. FantasyDraft has a pretty solid variety of user created and guaranteed salary cap contests. Those players who have played less than 60 games qualify for a Beginner’s league on FantasyDraft. There are 50/50 games are also on the menu, along with user created leagues, Head-To-Head games, as well as a number of qualifier contest to their larger events. Their wide variety of games on the table right in front of any user allows users to take advantage of both big tournaments as well as smaller ones. FantasyDraft has all the usual suspects in terms of cash games that you would normally find on other websites. Their pricing however, is fairly average, allowing players to fit a single all-star on their team, but probably not many of them on a regular basis. The website interface of FantasyDraft is pretty impressive, to say the least. Their navigation is rather foolproof and their live scoring is one of the best that we have seen so far on the DFA circuit. Watching fantasy match ups is a nail-biter, what with the fantasy points being displayed just a few seconds after they actually happen – a completely gripping experience. Not only is the website interface visually appealing and aesthetic, it doesn’t take a rocket scientist to figure out where to go and what to do. As of now, there’s just football to wrangle with, but in a matter of time, they planning to launch all seven major sports, including NBA, MLB, NFL, PGA, NHL, as well as college football and basketball. Their player profiles are displayed well, with all the information and stats a user might need to be able to make an informed decision. Gone are the days when you had to Alt+Tab your way to researching your team. Now with FantasyDraft’s unique player profiles, you have everything you could possibly need on a single page, like a player’s current season stats, splits, the most recent player and team news, as well as a summary of the player’s upcoming matchup. Needless to say, the seamlessness of the site continues well into its signup process as well. A few generic details later, you are the proud owner of an account on FantasyDraft.com. It is super quick and super easy. There is a first-time deposit bonus up to $600 dollars on FantasyDraft which gets released in small increments each time a user plays. This prevents users to deposit and withdraw their bonus without even playing. As players enter more contests with their entry fee, deposit bonuses are credited into their accounts. Therefore, the more someone plays, the quicker their bonus will be deposited. Use our link, which will bring you to Fantasy Draft. Enter our Referral Code fantasport. Login and click deposit on the top right. There you will be asked to choose a bonus. We highly recommend typing in $600 individually. This will give you the maximum bonus on Fantasy Draft! The scoring system on FantasyDraft is pretty much on the same likes as DraftKings. Users can look forward to a full point for completions as well as bonuses when they reach certain milestones in the game. Three points for 300 yards passing and three points for 100 yards receiving and rushing. 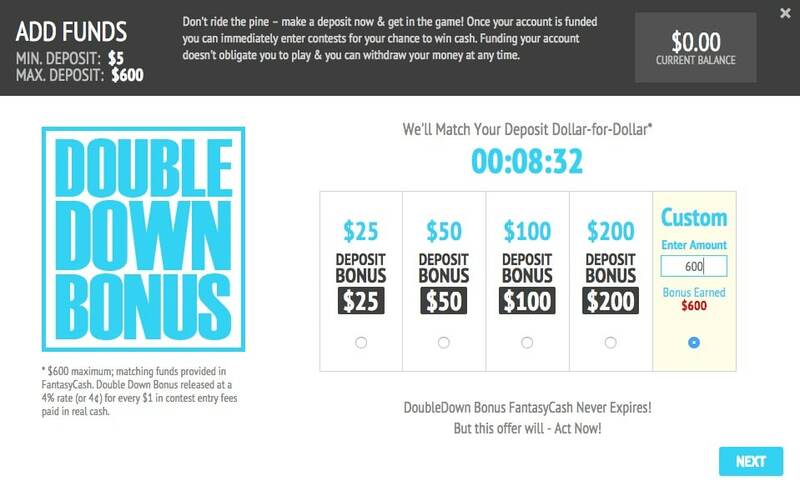 The deposit process on FantasyDraft is quite simple and easy. Users can choose to deposit cash PayPal and all major credit cards such as Amex, Visa, Discover, and MasterCard and are allowed to deposit an amount of their choice. FantasyDraft has the same level of legality as several other weekly fantasy sports sites. It is 100% legal in all states in the United States and Canada, except Louisiana, North Dakota, Montana, Iowa, Washington, Kansas, Arizona, the Canadian province of Quebec, or any other location where these activities aren’t permitted by law due to state-specific regulation against cash prize awards. By law, daily fantasy sports have been considered as ‘a game of skill’, and hence are exempt from the category of banned online games. FantasyDraft has a rather concise and comprehensive FAQs section that covers almost every single query that a user might have. If there is anything specific that is on a user’s mind, they have an online form to fill out on the website to which the team at FantasyDraft will reply with a resolution. There are also many how-to videos on the site that give rookie players an idea of what to expect. When the beta site was launched, there were a few bugs and glitches, which is pretty much standard operating procedure. But this continued well into the launch of their full site as well. Having said that, since FantasyDraft is fairly new to the arena, we’re prepared to cut it a little slack. With these issues currently being worked on by the team, a resolution seems to be on-hand pretty soon. That and the fact that there aren’t too many promo codes to boot, a lot of players seem to be giving into the draw of the other bigger contenders. FantasyDraft seems like the real deal and everyone seems to be excited. As of now, the DFS circuit seems to be ruled by the two obvious bigwigs, but FantasyDraft is all set to change that. These underdogs or ‘rookie sensations’ as they like to call themselves, may just be instrumental in changing the face of daily fantasy sports as we know it. Their professional partnerships and strong referral models seem to be a bone to contend with. Since they are still teething, only time will tell how well they are able to take the top contenders of the DFS circuit head on. Soon the industry will be able to determine if FantasyDraft is a contender or a pretender.